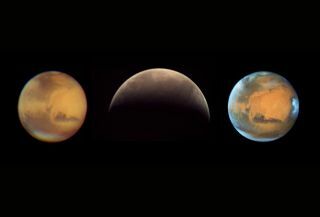 Three views of Mars at its best for 2016 take center stage in this collage of images by amateur astronomer Dylan O’Donnell (at left as seen from his home-built backyard observatory in Byron Bay, New South Wales), the European Space Agency's Mars Express spacecraft (center) and the Hubble Space Telescope. The images were all taken in mid-May 2016 to mark Mars' arrival at opposition on May 22, 2016. As Mars reaches its closest approach to Earth in more than a decade tonight (May 30), you can watch the Memorial Day Martian event live online through the Slooh Community Observatory. The broadcast starts at 9 p.m. EDT (1 a.m. UTC) and can be viewed live on the Slooh website. Viewers can send questions to @Slooh on Twitter, or chat live with the team on Slooh.com. The webcast will also be available here on Space.com. Every 26 months, Earth and Mars come to the closest approach in their orbits. During the period between Mars' closest and furthest points, the Red Planet's size changes sevenfold from the perspective of Earthbound observers, Slooh officials said in the statement. "The size of Mars varies more than any other planet, and we've waited a full decade for it to come this close and appear this large," Slooh astronomer Bob Berman said in a statement. "Throw in the fact that it's the only other planet on which humans will ever walk, and you can understand why everyone will be tuning in to this rare occasion." The Slooh show will include discussion about Mars science, the planet's cultural significance and also the chances for life on the Martian surface. Berman will co-host the broadcast with fellow Slooh astronomer Paul Cox. The show will also feature Nicole Willett, of the Mars Society, who will talk about the planet's potential for exploration and settlement. This sky map shows the location of Mars in the southeastern sky at 9 p.m. local time on May 30, 2016, when the planet will be at its closest to Earth in 11 years. Saturn will also be visible nearby, weather permitting. The commercial spaceflight company SpaceX announced in April that it would send a robotic craft to Mars as soon as 2018, with manned flights to follow. A few years ago, a private organization called Mars One announced plans to send a crew of astronauts on a one-way journey to the Red Planet's surface. That mission is still decades out, but Mars One has selected finalist astronauts and is trying to secure funding and figure out the technology for the construction of the mission base. The company has said it expects robots to complete that construction.